From Cape Ann to New Bedford, numerous lighthouses are located along the coastline of Massachusetts, many of which still function today and are listed on the National Register of Historic Places. The lighthouses included in this itinerary were established in the 18th, 19th and 20th centuries. Some were constructed offshore on piers or breakwaters, while others were built onshore on windswept promontories, sandy bluffs or rocky ledges. Some are self-contained and others consist of multiple buildings, including keepers' dwellings, walkways, oil houses and other structures. Some are wood, while others are constructed of metal or stone. Much of Massachusetts's history and economy has been intertwined with the sea, as inland farmers and manufacturers exported their respective goods, fishermen harvested the waters and sailors and merchants traded around the world. The hazardous character of the coast, in addition to frequent storms and fog, complicated these activities. During the colonial years, each of the 13 colonies established lighthouses and other navigational aids according to their individual needs. In 1716, the first lighthouse constructed in the colonies was Boston Light on Little Brewster Island. Highly profitable trade with the French West Indies and other foreign ports largely determined the placement of the earliest Massachusetts lighthouses. New England fish, salt, lumber and meat were traded for West Indian sugar and molasses, which was shipped to Massachusetts and distilled into rum. Merchants sent the rum to Africa in exchange for slaves, who were then sold to West Indian sugar plantations. 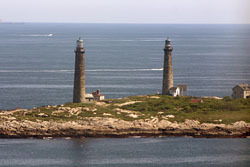 As maritime travel and trade increased and diversified, the need for more beacons in Massachusetts was realized and additional lighthouses were established, such as at Brant Point Light on Nantucket in 1746, Plymouth Light on Gurnet Point in 1768, Cape Ann Twin Lights on Thacher Island in 1771 and Newburyport Harbor Light on Plum Island in 1788. The newly formed Federal government understood that a more coordinated system of lighthouses was necessary to ensure the safety of crews and cargo, and maintain a large-scale maritime economy. Congress placed the responsibility for lighthouses, as well as all other aids to navigation, under the Federal government in 1789. 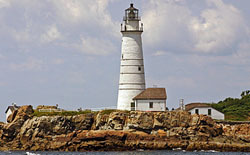 Several lighthouses were established on the coast of Massachusetts and on nearby islands around this time. Unfortunately, economy of operation ruled over efficiency which resulted in the lighthouses of the United States being considered as some of the poorest quality in the world. Many of the early lighthouses built by the Federal government, such as Straitsmouth Light, Race Point Light and Gay Head Light were eventually replaced with new and improved structures. Other lighthouses, including Derby Wharf Light, Scituate Light and Sankaty Light have been repaired throughout the years but remain standing. Straitsmouth Light, Race Point Light, Gay Head Light, Derby Wharf Light and Scituate Light are active Federal aids to navigation today. 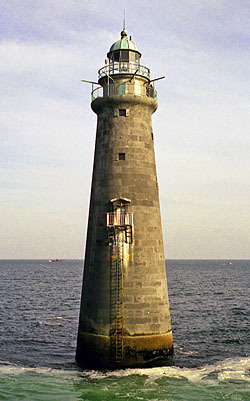 Although Sankaty Light received one of the first Fresnel lenses in the United States and was considered one of the most important coastal lighthouses in the United States, it was decommissioned in 1860 following the construction of the second Minot's Ledge Light, which more adequately marked the area than did Sankaty Light. Sankaty was again illuminated in 1994 as a private aid to navigation. After receiving numerous complaints about the Nation's system of lighthouses, the Federal government gathered a group of distinguished military officers and civilian scientists to conduct a large-scale investigation of existing lighthouses in 1851. The investigation determined that many light stations were in poor condition and therefore unable to meet mariners' needs. In 1852, the Federal government formed the Lighthouse Board, comprised of the individuals who conducted the earlier investigation, to take over all duties related to lighthouses and to improve upon them by using better building materials, new construction methods and advancements in lighting technology. 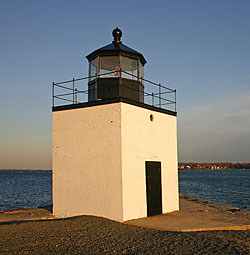 Some of the lighthouses constructed or reconstructed in Massachusetts under the direction of the Lighthouse Board include the Cape Ann Twin Lights, Marblehead Light, Minot's Ledge Light, Highland (Cape Cod) Light, Brant Point Light and Cape Poge Light. These lighthouses continue to serve as Federal and private aids to navigation today. At the same time the colonies were realizing a need for navigational aids, the citizens of Massachusetts were also concerned about the incidents of shipwreck and loss of life along the coast. Although a coordinated system of lighthouses and lightships helped many mariners avoid treacherous shoals and sand bars, the inevitable shipwreck occurred as the fog and New England weather forced ships aground with repeated loss of life. Based on the British model, prominent Massachusetts citizens founded an organization called the "Massachusetts Humane Society" in 1785, which would become the basis for the American system of rescue from shipwreck. The organization established huts along the shore to provide shelter for mariners in need and subsequently built lifeboat stations manned by volunteers. By the 1870s, the Massachusetts system of lifeboat stations had grown to more than 70 stations, but just as with the lighthouses, a more efficient system was needed as maritime trade expanded. Finally in 1871, Congress appropriated funds to create a coordinated system of lifesaving called the U.S. Life-Saving Service. Point Allerton Life-Saving Station and Old Harbor Life-Saving Station provide two excellent examples of lifesaving stations established by the U.S. Life-Saving Service. In 1915, the U.S. Life-Saving Service merged with the Revenue Cutter Service, the precursor to the U.S. Coast Guard, and lifesaving remains an important duty of the U.S. Coast Guard today. In 1939, the U.S. Coast Guard subsumed all duties related to lighthouses and other navigational aids. One of the U.S. Coast Guard's first actions related to lighthouses in Massachusetts was the demolition of Edgartown Harbor Light on Martha's Vineyard. It was replaced with an existing tower transported from Crane's Beach in Ipswich, Massachusetts. Cleveland Ledge Light was the last commissioned lighthouse in New England and the only one built by the U.S. Coast Guard in the region. The U.S. Coast Guard currently maintains most of the functioning lighthouses in Massachusetts, the majority of which have been automated, unmanned and converted to solar power in recent years.